NOTICE: Activation key must be used on a valid Steam account. Requires internet connection.ABOUT THE GAME Join the battle	Featuring a tense storyline, filled with plot twists, the title thrusts players into battle like never before. With amazing special effects, including rim-lighting, depth of field, texture streaming and character self-shadowing, players are enlisted into one of the most pho… to-realistic gaming experiences imaginable. The community-oriented Call of Duty 4 multiplayer gameplay features a robust leveling system, variety of unlockable perks, hot-join and matchmaking, as well as create a class and party capabilities to ensure that players of all skill levels can join in the fun. Additionally over 100 challenges and a host of new game environments and modes deliver unlimited possibilities. 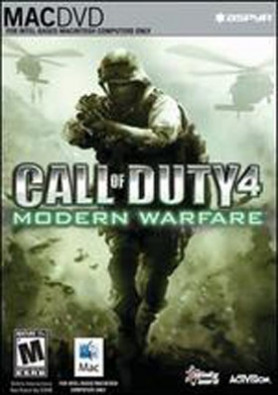 Infinity Ward has also included Kill-Cam, a fan favorite feature that they created in Call of Duty 2, which allows for spectator instant replays.KEY FEATURES Authentic Advanced Weaponry – Featuring an available arsenal of more than 70 new and authentic weapons and gear from assault rifles with laser sites, claymore mines, .50 caliber sniper rifles, and M-249 SAW machine guns. Coordinated Assault and Support – Delivering the most visceral action thriller ever, the title covers modern battle from the soldier to the satellite, where the need for air support is crucial to success. The adrenaline rush deployment enlists gamers to fast-rope from tactical helicopters, ride in an armada of attack choppers, utilize jets to remove enemy strongholds and even engage hostiles from thousands of feet above the ground inside a state of the art aerial gunship. Cinematic Quality Graphics and Sound – Featuring stunning next-generation graphics, players will be drawn into the cinematic intensity of Call of Duty 4: Modern Warfare. Combine the lifelike graphics and the realistic battle chatter with the Call of Duty award-winning sound design and players will face battle as they never have before. Unparalleled Depth to Multiplayer – The highly-anticipated multiplayer builds from the success of Call of Duty 2 deliver a persistent online experience for greater community action.SYSTEM REQUIREMENTS Minimum: Operating System: Mac OS X 10.6.8 or later CPU Processor: Intel Core 2 Duo (Dual-Core) CPU Speed: 2.0 GHz Memory: 1 GB Video Memory (VRam): 256 MB Hard Disk Space: 8.0 GB + 1 GB Swap File Video Card: ATI Radeon X1600/ NVidia GeForce FX 7300 Peripherals: Macintosh mouse and keyboardRecommended: CPU Processor: Intel Quad Core CPU Speed: 2.4 GHz Memory: 2 GB Video Memory (VRam): 512 MB Supported Video Cards NVIDIA GeForce 7300, 7600, 8600, 8800, NVIDIA GeForce Quadro FX 4500 ATI Radeon X1600, X1900, HD 2400, HD 2600.NOTICES: Intel integrated video chipsets (including GMA 950) are not supported. Apple Intel Chipsets only. Power PC Processors (G4 and G5) are not supported. This game is not supported on volumes formatted as Mac OS Extended (Case Sensitive). © 2008 Activision Publishing, Inc. Activision and Call of Duty are registered trademarks and Modern Warfare is a trademark of Activision Publishing, Inc. All rights reserved. This product contains software technology licensed from Id Software (Id Technology). Id Technology © 1999-2007 Id Software, Inc. The ratings icon is a registered trademark of the Entertainment Software Association. Aspyr is a registered trademark of Aspyr Media, Inc., and the Aspyr star logo is a trademark of Aspyr Media. Mac and the Mac logo are trademarks of Apple Computer, Inc., registered in the U.S. and other countries. All other trademarks and trade names are the properties of their respective owners.